Kotolena Restorative System is our the most comprehensive and cost-effect anti-aging system containing both the Matrikine Peptides Complex and Matrikine Peptides Serum. 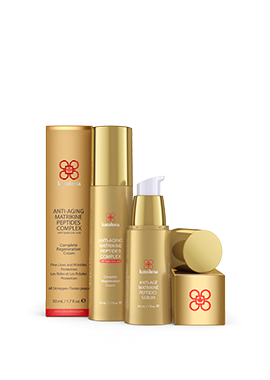 This skin-care supersystem contains our best of the best products that crafted to dramatically reduce the look of multiple signs of aging. We consider this system the crown jewel of all the hard work by our team of MDs and Ph.Ds has done to reveal your skin’s beauty and your confidence.We examined every last detail, meticulously selected the most efficient and the finest quality natural ingredients to bring the best of the best for your skin. It works for all skin types. We knew it was just a matter of time before some as knowledgeable as yourself found this luxurious jar of rich anti-aging cream to treat your skin for amazing results. Crafted with precision to work quickly, Anti-Age Matrikine Peptides Cream is a perfect scientific solution to enhance and preserve your youth and beauty. Day after day it will help nourish, hydrate and smooth the skin to keep your best face forward! Don’t let the dewy lightness of our Anti-Age Matrikine Peptides Serum fool you! Anti-Age Matrikine Peptides Serum is the smart way for ideal skin’s appearance that provides instant hydration with a weightless feel.This unique skin beautifying essence contains a powerful, proprietary formula developed by our MDs and Ph.Ds. 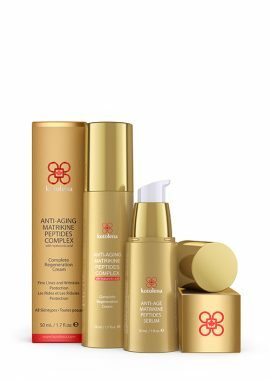 Anti-Age Matrikine Peptides Serum is formulated with optimal levels of the most effective Matrikine peptides and Herbal Extracts. It provides the long-term protection and hydration your skin needs to stay looking its best! Anti-Age Matrikine Peptides Serum works quickly to reduce the look of fine lines and wrinkles imparting elegant radiance. 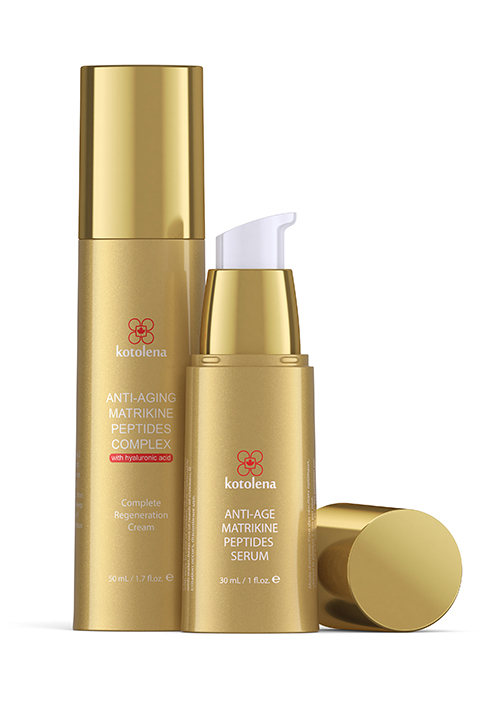 Anti-Age Matrikine Peptides Serum is the 1st Step in Kotolena Restorative Synergy System TM. For best results apply the Anti-Age Matrikine Peptides Serum as Step 1 of Kotolena Restorative System in the mornings and evenings. We offer completely FREE North American shipping as well as cost-effective international options. Simply select the appropriate shipping option for domestic or international delivery during checkout. If you’re ever unsatisfied with any product please e-mail to info@kotolena.com and we’ll do everything we can to make it right. We are confident that you’ll love our products and we stand behind them. Please report any dissatisfaction with any product to our customer happiness team at info@kotolena.com and we’ll make things right away with our 100% money-back guarantee*. Aqua, Caprylic/Capric Triglyceride (Coconut Oil), Glycerin, C12-15 Alkyl Benzoate, Sodium Hyaluronate, Niacinamide (vitamin B3 or nicotinic acid), Hydrogenated Soy Glyceride, Cetearyl Alcohol and Ceteareth-20, Stearic Acid, D-Alpha Tocopherol (form of the most biologically active Vitamin E), Butylene Glycol, Polysorbate-20, Palmitoyl Oligopeptide, Palmitoyl Tetrapeptide-7, Olea Europea (Olive) Oil*, Vitis Vinifera (Grape) Seed Oil*, Cocos Nucifera (Coconut) Oil, Oenothera Biennis (Evening Primrose) Oil*, Beeswax, Borago (Borage) Officinalis Seed Oil*, Cucurbita Pepo (Pumpkin) Seed Oil, Neem (Melia Azadirachta) Seed Oil, Persea Gratissima (Avocado) Oil*, Zinc Oxide, Cetyl Alcohol, Propylene Glycol, Diazolidinyl Ure, Iodopropynyl Butylcarbamate, Zingiber Officinale (Ginger) Root Extract, Panax Ginseng Root Extract, Salix Alba (Willow) Bark Extract, Ascophyllum Nodosum(Atlantic Kelp) Leaf Extract , Rosmarinus Officinalis(Rosemary) Leaf Extract*, Chamomilla Recutita (Matricaria) Flower Extract*, Aloe Barbadensis Leaf Extract*, Cucumis Sativus Seed Extract*, Saccharum Officinarum (Sugar Cane), Acer Saccharinum (Sugar Maple) Extract, Citrus Aurantium Dulcis (Orange) Fruit Extract, Citrus Medica Limonum (Lemon) Fruit Extract, Retinyl Palmitate (combination of retinol/pure vitamin A and palmitic acid), D-Panthenol (Pro Vitamin B5), Citrus Aurantium Bergamia (Bergamot) Fruit Oil, Calcium Ascorbate, Caffeine. Aqua, Glycerin, Sodium Hyaluronate, Zingiber Officinale (Ginger) Root Extract, Panax Ginseng Root Extract, Salix Alba (Willow) Bark Extract, Ascophyllum Nodosum(Atlantic Kelp) Leaf Extract , Rosmarinus Officinalis(Rosemary) Leaf Extract*, Chamomilla Recutita (Matricaria) Flower Extract*, Aloe Barbadensis Leaf Extract*, Cucumis Sativus Seed Extract*, Butylene Glycol, Carbomer, Polysorbate-20, Palmitoyl Oligopeptide, Palmitoyl Tetrapeptide-7. Start by applying the Serum on a cleansed skin. Apply 5-7 drops of the serum to clean skin. Apply with upward, gentle strokes until well absorbed, starting from the inside of the face and moving outward. When serum absorbs into the skin apply 1-2 puffs of the Creme and smooth on gently with your fingertips. Make sure to massage the skin gently while applying the Cream.